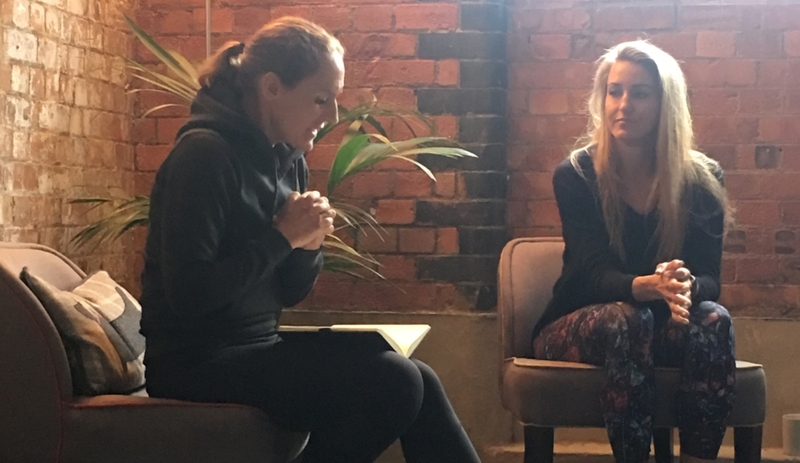 We recently met with Megan Swanson from Just Breathe Counselling, a clinical and sports psychology doctoral candidate (completing her doctorate in May 2019) to discuss motivation and how it connects the mind, body and soul. Megan is trained in positive psychology, mindfulness, Cognitive Behavioural Therapy (CBT) and personal training. She is a former university professor, avid runner, and believer in the power of the connection between the mind and body in terms of mental health and holistic wellbeing. Megan is from Bozeman, Montana and lives in London with her family. In part 2 (part 1 here) of our Motivation for Mind, Body and Soul series (roughly a 5 minute read! ), we ask Megan to share her perspective on the concept of motivation and how much like a muscle, the more you stretch the muscles of motivation and learn what motivates you… the more you will be able to control and utilise motivation to work towards your goals and successes. How would you define Motivation and can you share why we need motivation to be our best in mind, body and soul? Motivation is what causes a person to act in a certain way, to do something specific, or to repeat a behavior. Although we think that we need motivation in order to do something, often the act of starting something is when we ignite motivation. Motivation is therefore the result of action and activity. In order for motivation to be maintained and long-lasting, it needs to feed the mind, body and soul. We are holistic beings and all of these things are connected. If we can find ways to motivate all three of these areas, we will be better set-up to remain motivated and to find those things in our lives that fulfil us, making us more content and happy over the long-term. An example might be when I watch my son play rugby. He never used to be excited by sport and was always really demotivated to participate in any sporting activity. But last year he started rugby. The club, the vibe, the coaches, teammates and fellow parents really fed his soul. They love him and he in turn equally loves them and has found a sense of pride and motivation for rugby. He is learning, and growing and doing so in an organic way that allows for small failures to come in equal parts or be outnumbered by successes. Thus helping him learn how we naturally grow and change. And this feeds his mind. He is able to expel energy in a positive way, run, be tactile, raise his heart rate and do so joyfully. This feeds his body. All of these three things mean that on a Sunday morning, even in the most horrible of British conditions… he is highly motivated to go to practice or play in tournaments. Motivation helps us to find and create patterns of behaviour that are positive. We are demotivated by negative behaviours and negative patterns, so it is a natural sign to us that whatever is demotivating us is likely not positive. Now, that isn’t to say that every demotivating thing is negative, but when we derive motivation from something that really ignites us; our mind, body and our soul… it is generally something that is positive for us in numerous ways. And just like energy begets energy, sleep begets sleep…. Motivation begets motivation. We are building those “muscles” and helping ourselves to better understand what drives us. Our talk subtitle is “Where there’s a will (and a why), there’s a way…” can you share your thoughts on why the why is such an important addition to this well-known phrase? So much of people wanting to “get motivated” or “stay motivated” is the carrot and the stick analogy, which in fact doesn’t really work. I love to talk about the WHY because until you have a “why”, what you are hoping to do/change/be won’t stick. Why would it? You can follow an incredible recipe perfectly, do all the right things with all the right ingredients, but if you don’t like the food… you likely won’t go through all of the effort to make the recipe again, right? There are two types of motivation – intrinsic and extrinsic. Our most powerful motivators are those that are intrinsic or internal. They are steadfast, and where you’ll find your “why” and your value. Although it may not always seem so, we are in control of our intrinsic motivations. When we can begin to understand what we are motivated by intrinsically – things that we love for the sheer joy of doing them; a love of the process, the journey, mastering a skill, etc. – we can create situations where we foster that motivation. Extrinsic motivation comes from outside rewards or benefits, accolades, etc. These are out of our control and tend to have many more peaks and valleys leaving us seeking multiple sources of external motivation. So, although these can work for something short term or as a piece of the puzzle when it comes to a long-term plan… they are fleeting. Remember, motivation is not static. It will ebb and flow. When motivation is low, you need to address it right away. Consider what has changed? What things have stayed the same? Try to understand the patterns that are associated with high and low motivation. Once you identify the patterns, you’ll be better able to identify warning signs when motivation is about to take a dive and stop it in its tracks. DEVELOP STRATEGIES! The term “where there’s a will, there’s a way” really ties into determination or grit which are important for meeting goals that you have set for yourself and progressing forward in a positive way. But before we develop those things, we need to have a solid foundation for the why, and what value those things hold for us, or the rest will never truly come together. What is will power, and how do we find it, and implement it? As a positive psychologist, I like to reframe things in ways that are more positively associated. For example, instead of talking about will power (which in and of itself is not negative, just rarely is talked about in a positive way), I would talk about finding “grit” or “determination”. Grit is having a passion to accomplish a particular goal and the perseverance to follow through. It is inner strength that is built over time. So how do we get “grit”? I would suggest that some people have more innately in them than others, but that we all have the ability to get it, and once you have developed “grit” it becomes a part of your character and who you are as a human being. To get grit on your own is difficult. I read a book on the “culture of grit” once, and in it they talked about how to get grit. A quote from it that always stuck with me is: “If you are around a lot of people who are gritty, you’re going to act grittier”. As humans, we are innately driven to fit in and conform, and while I would never suggest that you be something that you aren’t… quite the opposite. I am the biggest cheerleader of ALWAYS BE YOU! Sometimes we need to find the right environment in which to foster being and finding our best selves. Examine who you are spending your time with and what groups that you are naturally conforming to. Are they gritty? Do they have characteristics that you want to employ? So, although will power is important; it is more of a shallow version of grit in that it is “to do or not to do” in a short-term sense, whereas grit is a part of who you are. It’s ingrained and innate as much as it is developed over time and through positive cultural and community influences. With will power, we tend do a quick cost/benefit analysis on the spot. It’s a short-term analysis that doesn’t take into account long term costs or benefits of an action, behaviour or response. We can’t always calculate our passion or our perseverance, but once we can feel them in our mind and soul… they are there. We know the sensations, we know the benefits, we feel them holistically and see their effects in all areas of our lives. So each time we do something “gritty” or spend time with “gritty” people doing positive things, we are growing our internal grit store and our ability overcome future obstacles. What is way power, and its significance in terms of motivation and goal-setting? I think of “way power” as the logistics centre of motivation. So, you have set a goal… you are motivated, but in order to ensure that you stay on track for your goal, you need to ensure that your logistics are in place. It’s the pragmatist within the scenario. What do you need to ensure your motivation can be maintained and your goal can be met? Do you know what you need? Do you have a support system in place? What does that look like for you? Do you have the financial means necessary to meet whatever goal you have set? If not, how will you navigate that? Does your life and schedule reflect your goals and what motivates you? What might you need to change in order to remove things that demotivate and add things that motivate? Ensure that your environment, your community, and your personal inner monologue reflect what you know about what motivates you and what you are passionate about. Mindfulness is an amazing tool for keeping mentally fit. It helps us to be present and develop tools that allow us to “respond” instead of “react” to situations. I do this through random one minute breathing exercises, but also through being present with my friends and family, and ensuring that sometimes I take a second to just take in my surroundings. I have always been a runner, and for me there is great joy in just putting one foot in front of the other. It’s a metaphor for fitness and for life for me. The past few years, I have really focused on challenging myself to do things that put me out of my comfort zone in a holistic way. The bonus of this challenge has really helped me develop a stronger community! And finally any tips & tricks on wellbeing? Wellbeing is holistic. When one thing is out of sync, the rest suffer. Thus, you cannot focus solely on one and not the rest. Understanding that your mind affects your body and your body your mind, really is the first step. And communication. When we start to have more of these conversations, we are helping to break down the stigmas and create a community. We are helping people we don’t even realise, and we are simultaneously helping ourselves. Thank you to Megan for sharing your thinking and wisdom on motivation for mind, body and soul with us. You can get in touch with Megan directly here.